Florida has come a long way in the beer world in the last few years. We now have a great selection of beers to choose from and you can buy growlers of beer at stores. One thing you still can't do though is buy beer from your local brewpub to drink at home. I'm sure there have been nights when you've sat at home and thought, "Boy, I would love one of those great beers they make over at (insert local brewpub name here) but I just don't feel like running out to the bar tonight. I wish I could just grab one out of the fridge." Well, the day has come to help make your dreams come true. 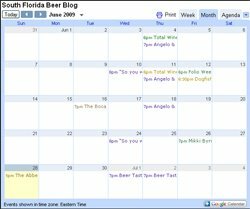 Here is what the Florida Brewers Guild is asking you to do. The deadline for Representatives to submit bills for this years session is tomorrow, so please ACT NOW!!!!!!!!" Do your part and help your local brewpub...and yourself. previous for you buy, inspect the necklace and see if it actually is real.